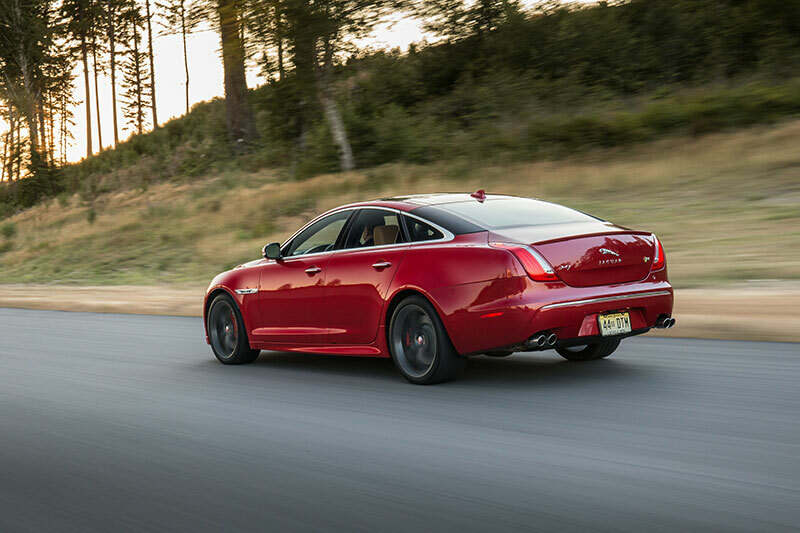 The XJR returns to the Jaguar model line as the quintessential Jaguar flagship sports sedan, offering British luxury with extraordinary sporting performance. The XJR incorporates bespoke chassis and aerodynamic developments to create the most sporting member of the XJ sedan family. This all-aluminum V8 engine delivers exhilarating performance and efficiency thanks to technologies such as spray-guided direct injection (SGDI) and dual independent variable cam timing (DIVCT). The high-pressure die-cast lightweight aluminum block is stiffened with cast-iron liners and cross-bolted main bearing caps, providing refinement to match its power. The engine breathes through aluminum four-valve cylinder heads, and the intake is pressurized by a Roots-type twin vortex supercharger. Two air to liquid intercoolers, which feature their own water-cooling circuit, reduce the temperature of the intake charge to optimize power and efficiency. Maximizing the benefit of the engine calibration is the eight-speed automatic transmission. This transmission system brings out the sporting nature of the XJR while still maintaining the car’s composure in town and in low-speed driving environments. When operating in automatic mode, the transmission can detect the manner in which the car is being driven by monitoring acceleration, braking, cornering forces, throttle application, brake pedal activity, road load, and kick down request. On detecting a more enthusiastic driving style, the transmission will automatically make the gearshifts more aggressively and move the upshift point to a higher RPM. Steering wheel-mounted gearshift paddles allow manual gear selection. Corner Recognition senses when the car is negotiating a curve, and the transmission will hold the correct gear for the exit. The transmission will also recognize when the car is performing a series of overtaking maneuvers requiring rapid changes in throttle position and, rather than change up, remain in a lower gear ready for the next demand for acceleration. The Jaguar Intelligent Stop/Start system is standard. This system automatically reduces idling by stopping the engine when the car comes to a stop with brake pedal depressed. When the brake pedal is released, the system will restart the engine in less time than it takes for the driver’s foot to move from the brake pedal to the accelerator. A twin solenoid system which features separate actuation of starter gear engagement and drive motor actuation, it allows for ‘change of mind’ functionality, bringing the engine back up to speed even during its run-down phase if, for instance, the car is coming to a halt at an intersection and the driver sees an opportunity to join the traffic flow. Tuned dampers and spring rates maximize the sporting handling capabilities of the car while providing the signature ride comfort expected of a Jaguar. Jaguar Adaptive Dynamics actively controls vertical body movement, roll, and pitch rates through the use of continuously variable dampers. The system monitors driver inputs and the road conditions, adjusting damper rates in response up to 500 times a second. The driver’s selection of Dynamic Mode calibrates the damping rates to the firmer end of the available range. The Jaguar active electronically controlled differential can apply full locking torque almost instantaneously when necessary, and has been calibrated to utilize the high levels of grip and power. Working in parallel with the differential, the ‘Trac DSC’ setting of the Dynamic Stability Control system now offers the enthusiastic driver more opportunity to explore the outer edges of the handling envelope. The steering hydraulics and calibration have also been engineered to enhance steering feel, response and feedback under all driving conditions. 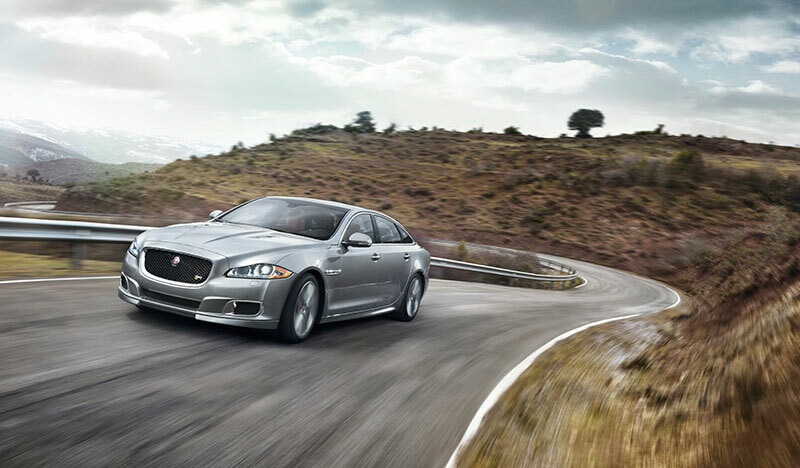 In order to achieve the maximum benefit from the suspension, the XJR has new lightweight, forged 20-inch alloy wheels. The tires were specifically developed for Jaguar in conjunction with Pirelli. They are 265/35-20 and 295/30-20 front/rear and have been specified to deliver optimal cornering grip, traction and stability over a wide range of speed and performance parameters. 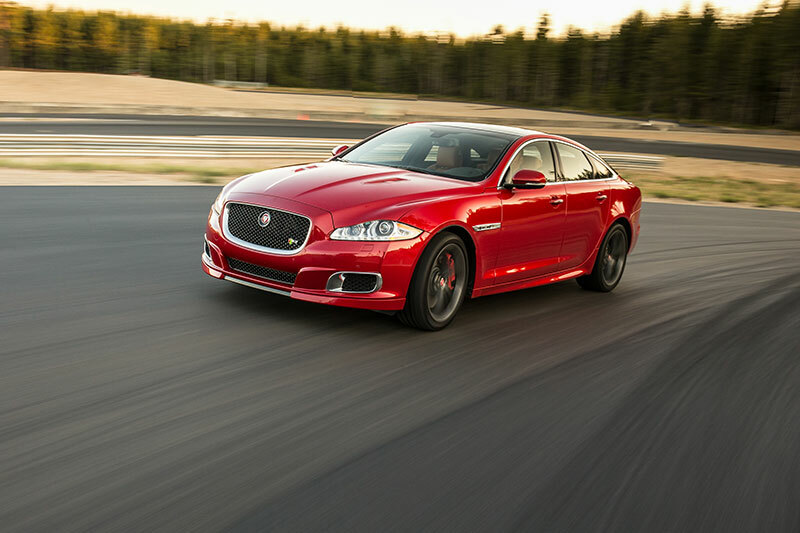 The Jaguar High Performance Braking System offers an unmatched combination of power, stability and fine modulation. The 15″ (380mm) front and 14.8″ (376mm) rear discs are internally ventilated. The appearance of the XJR has been modified with functional aerodynamic enhancements. The side rocker sills, unique to the XJR, serve to create a sharp break-off point between the bodywork and the road surface in order to keep the airflow attached to the car’s sides for as long as possible. Rear lift is also reduced through the fitment of a trunk lid-mounted lip spoiler to manage the airflow off the top rear surface of the car, while hood vents aid in aerodynamics and engine cooling. The car’s dynamic intent is underlined by the palette of materials used on the interior. Jet Black leather trim is available with a choice of either Ivory, London Tan or Red Zone inserts on the seat facings or simply Red Zone or London Tan contrast stitching. The seats themselves are embossed with the ‘R’ logo. Jet Black suede cloth headlining is standard. Interior veneers are available in either Carbon Fiber or Piano Black. An 825 watt, 18-speaker surround-sound system from British audio experts Meridian™ is standard. Recognized by audiophiles as a leader in audio reproduction, Meridian has developed a proprietary Trifield™ System that places every occupant at the center of their own perfectly focused surround-sound arena. 1 Price shown is MSRP. Excludes $895 destination/handling fee, tax, title, license, retailer fees and optional equipment. Retailer price, terms and vehicle availability may vary. See your local Jaguar Retailer for details. 3 All figures are EPA estimates. Actual mileage may vary.